What does it take for the Racepak 800-SS-MSC-5 speed sensor to talk to a SSI-4 Plus Interface from Innovate Motorsports? The SSi-4 interface needs a 0-5 volts input. Do you have the configuration for the sensor? I have used the SSI-4 previously. The input on the SSI needs to be configured to accept a frequency. Once this is done then you can calculate the pulses/distance. Any reason you are not using it on Vnet? The SSI-4 has the capability to measure frequencies on any of the channels. It converts a frequency signal (pulses per second) into a number between 0 and 1023 (or 0..5V) to be logged directly by LogWorks. This is useful for measuring custom RPM ranges, signals from speed sensors or the frequency of MAF sensors with frequency output (as opposed to voltage output MAF sensors). The range of frequencies that the SSI-4 can measure can be programmed by with LM Programmer. The SSI-4 can be set to any frequency range between 0 and 30 Hz for the full 0..5V range to 0..15 kHz for the full 0..5V output (logging) range. 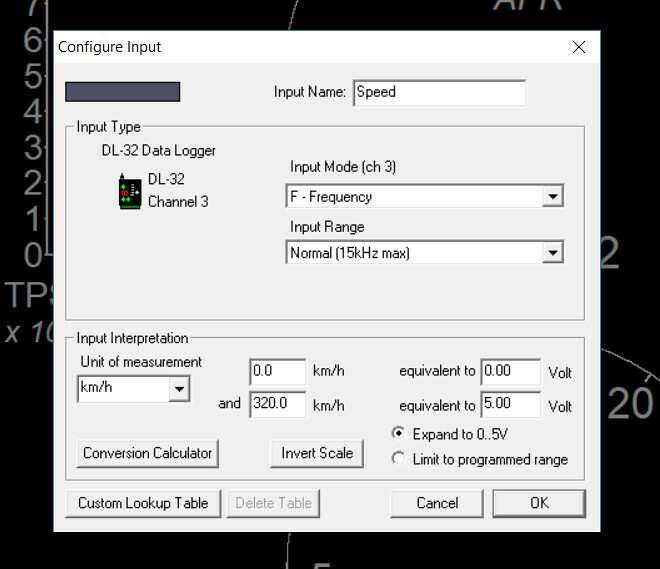 Also, LM Programmer has convenient conversions built in, so you don’t have to calculate the resulting frequency ranges for speed sensing or RPM sensing yourself. See chapter 10.x for details. A frequency input signal must have an amplitude (voltage range of pulse) between 0.5V at the low pulse point to minimum of 3V and maximum of 40 V at the high pulse range. The sensor is a HE three wire sensor. The split ring has 8 magnets. Both items from Racepak. I am using the Innovate products because I had those first measuring a/f and tach. I have programmed channel #1 on the ssi using LM programmer to be a speed sensor on a drive shaft, I’ve input the number of pulses per revolution as 8, tire size 32” and final drive ratio 5.14. I have a good strong signal from the sensor and magnet but Ssi-4 is not interpreting the signal. No other selections except custom look-up, invert scale and conversion tables. Like yourself I started off using Innovate (Logworks is great software) however since it did not have (nor did it look like) it was ever going to have GPS capability I moved away from it to Racepak! It was frustrating that the DL32 had an input for GPS but it was for 'future' use. Not having GPS for track position makes data analysis useless But I digress. Looking at my old config files I could set the speed up to 320kmh. The hall sensor picked up the ABS sensor ring fitted to the car. However since I do not have any Innovate items I can not open the channel and play with the configuration, apologies. What I did find with using the ABS ring was that there were too many teeth for the sensor to use and hence the 'speed' was being misreported. Teeth were cut off the ABS ring and after that it worked fine.